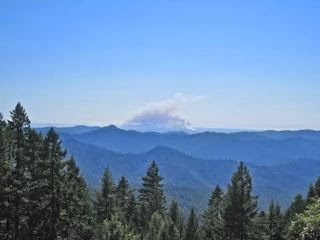 This THP is about 6.5 miles NW of Willits, CA at an elevation of 650 to 2,400 feet. Emcot Forests is planning a tractor and cable logging operation on steep and unstable slopes in redwood and Douglas fir forests. There are 13 road failure and landslide terrain sites including earth flows, debris slides and fill and cut bank failures. Emcot Forests wants to use tractors on existing skid trails on steep slopes over 65% grade, use a landing inside a class I watercourse, and use a skid trail inside a class II watercourse. They also want to use ground based equipment in areas designated for cable logging to pull trees away from streams, construct firebreaks, tail holds and where deflection is poor. There are 104 road drainage work sites including rocking, dip construction, and culvert repair and replacement. Overall, This THP will remove 222 acres of spotted owl nesting/roosting habitat, create 117 acres of foraging habitat, and convert 117 acres into additional unsuitable habitat within 1.3 miles. For spotted owl site MEN0329; this THP will remove 23 acres of nesting/roosting habitat within .7 mi, and create 4 acres of foraging habitat within .7 mi; for spotted owl site MEN0437; this THP will remove 15 acres of nesting/roosting habitat within .7 mi, and create 14 acres of foraging habitat within .7 mi; for spotted owl site MEN0634; this THP will remove 4 acres of nesting/roosting habitat within .7 mi, and create 3 acres of foraging habitat within .7 mi. More information is available on the THP Tracking Center website.